The Palmerston North Branch of the Theosophical Society was established in 1911. Members meet regularly and discuss theosophical topics. It is an opportunity for like-minded people to share and learn together about life's journey. Topics investigated are broad and varied and guaranteed to whet any appetite. We welcome all those seeking inner peace or equanimity. Suggested donation $5 (Unwaged $3) towards Hall expenses. STUDY GROUP last Tuesday of the month - for members. Those interested in membership are invited to attend a few events before making application. TUESDAY 7.30 pm 30 April - Theosophy in the Twenty First Century series. NB Check the programme schedule for dates and the topics. Local community musician, Guy Donaldson, discusses music and the brain, how music connects with our consciousness, the historic connection of music with spirituality, the insights of Pythagoras, music’s relationships with mathematics and quantum theory, and how the quest for meaning has led some philosophers to believe that mathematics and music equally point to there being some givens in the universe beyond our immediate apprehension, but which form the basis of our existence. Guy Donaldson received his formative piano instruction from Maurice Collier, and then at Canterbury University with Maurice Till. In 1984 he studied in London with Paul Hamburger and Roger Vignoles. Guy was a senior lecturer in music education at Massey until 2004, when he took leave to pursue his passion for performance and music teaching. He is active in the Manawatu as a teacher, adjudicator, piano soloist, accompanist, chamber music player and music coach, and was until the end of 2018 music director of the Renaissance Singers. He has in recent times given talks to U3A and to the Theosophical Society. 7.30 pm Piano Recital - more information pending. Self Awareness Yes, but Which Self are we Talking About!? Vegetarian and Vegan Potluck dinner at approximatelty 6 pm. Please bring a vegatarian or vegan plate to share. We set the stage by exploring the striking ways that things are interconnected in Nature, and then consider how spiritual oneness leads to fulfilment and joyful service as our deepest nature unfolds. Participants are invited to bring a vegetarian or vegan plate to share in hosting John. on the traditional NZ diet and the health issues involved. Among the awards won are Best Documentary Feature and Best Message – the message being on how to escape a lot of our modern diseases (diabetes, obesity, heart disease, many cancers, osteoporosis, and gut diseases). - includes how to deal with negative emotions and reactions, and understand how the mind is really meant to work. This Workshop is both intellectual and practical with discussion and feedback. Barry Bowden is a National Lecturer for The Theosophical Society in Australia. He has twenty three years of Bio-Dynamic farming. William is an influential and respected teacher of The Esoteric Philosophy. He has established an international reputation for his gift as a communicator of this philosophy. His extensive teaching program includes a diverse array of workshops and lectures devoted to nurturing a deeper understanding of the spiritual path, both from an individual and global perspective. His undergraduate degree is in business administration. His Masters Degree is in psychology and his Doctorate Degree in Esoteric Philosophy. This is a Theosophical Society in America webcast. Jiddu Krishnamurti (1895 – 1986) was an eminent writer and speaker on philosophical and spiritual issues, including psychological revolution, the nature of the human mind, consciousness and evolution, meditation, human relationships, and bringing about positive social change. Bill Taylor, the Development Director of the Krishnamurti Foundation Trust, England, will visit Palmerston North and speak on about his work with the Krishnamurti Foundation Trust and Brockwood Park School, Tuesday 26 February 7.30 pm till ~ 9.30 pm. Bill is originally from New Zealand. Where did the Ancient or Divine Wisdom teaching come from? The teachings are the basis of civilization as we know it. All the major religions and philosophies derive from these teachings. But where did they come from? explores the origins and development of the ‘great teachings’ and the first great teachers, those who pointed the way to our divine nature and to fulfilment in our return to the Divine (by whatever name). Theosophy is a modern version of the ageless teachings that form the basis of ‘The Way’ or ‘The Journey,’ – the return to Source. Warwick says that Ancient Egypt held and taught the secret knowledge. But where did they get the knowledge from? Was there a lost ‘Civilization X’, a source of the great teachings? If so what happened to it, and when? Warwick Keys, TSNZ past National President and Life member of the Wanganui Branch, is a long-time theosophical student, TSNZ national speaker and meditation teacher with a background of research, writing, business, national politics, history study and photography. Warwick has had a deep, lifelong interest in ancient civilizations and in Egypt in particular. Saturday 29 September 7.30 pm. Sacred Activism - Murray Stentiford touring on behalf of TSNZ. Preceded at 6 pm by a Vegetarian Potlumber beginning at 6 pm. Sacred Activism - Contradiction in Terms or our Only Hope? The world may be waking up but it needs us more than ever to tap into the sacred fire deep within every human heart, and put it into action. How can we express Divine Universal Compassion in radical action but stay grounded? This talk aims to look fearlessly at the problems and inspire with possibilities, within the spacious worldview of Theosophy. Discussion is welcome, whatever your spiritual belief or none. 'Humans, Energy and Healing' - Terry Murphy (Hawkes Bay) will explore the current thinking on the nature of energy, the history of energy and how we use it in our daily work. ‘Yoga Nidra or Yogic Sleep for Self-Healing’ - Sushma Webber (Wellington) It is said we are living in a sleep-deprived society resulting in long-term consequences such as heart problems, diabetes and obesity to name a few. Recent studies have found that Yoga Nidra, an ancient yogic technique, has many physical benefits. However, the Yoga Nidra practice is rooted in awareness and helps in self-transformation when practiced regularly. 'Yoga of Light Meditation' - Dr Simon Webber (Wellington) The Yoga of Light meditation was devised by Geoffrey Hodson, author and well known, and respected, member of the Theosophical Society, as a guide to one's meditation practice. Simon will talk about the 'Yoga of Light' method and then lead a meditation using this guideline. ‘The Energy of Love’– with ‘Ekanta’ - Helen Sussmilch. Self-transformation. “If you see with the eyes of love, love is all you see.” Using contributions from the teachings of Patanjali, Jesus Christ and the Ishayas. Covering how to regain our authenticity, healing the Shadow Self, and living with simplicity. ‘Our Energy Systems and the Daily Energy Routine to Self-Help’ – Anthea Clement will explore the human energy systems and how, using this knowledge, we can help ourselves, and others, to better complete health. Includes practical with the simple, yet powerful techniques of Energy Medicine. Everyone can enhance the health of the body’s energies. Facilitators from Wellington, Hawkes Bay and Palmerston North. Values express our unfolding capacity to invest in, and devote ourselves to, activities within the world and within ourselves. Julia has taught both in Australia and for TSNZ. She will look at the living ness of theosophical ideas as they influence life, their relevance in providing an ‘anchor’ and a ‘compass’ in our rapidly changing world. - Essentially knowing how to enhance this “electrical flow” may be useful in promoting well-being. The gradual realisation of the significance of electricity in the human form was initiated by Harold Saxton Burr - Blueprint for Immortality - Electric Patterns of Life. Since then much investigation has contributed to our understanding. Several researchers and their work will be discussed. Orest Tarnawsky had an early career as an art teacher and sculptor. Deep interest in the Ageless Wisdom teachings led him to attaining a Masters of Science in Esotericism through the University of the Seven Rays. Combined, these developed Orest’s passion for and skill in mentoring those on the quest towards awakening consciousness and in teaching the Ageless Wisdom teachings through creative expression, study and meditation to all that enquire the way. He has a particular interest in plasma, sound and electricity in their microcosmic and macrocosmic aspects. (Diploma in Teaching, Bachelor of Arts (visual arts). Master of Science in Esotericism (esoteric psychology)). The goal is to awaken our awareness to who we are, the steps of which are made remarkably clear through this exposition by the famous sage Patanjali. Modern yoga today is a small part of one of the steps involved which becomes much more powerful with the underlying practices shared in this great text. John Vorstermans is the National President of the Theosophical Society in New Zealand. He is a qualified Ayurveda medical practitioner and herbalist, with interests in evolving technologies in education. He has studied many aspects of the ancient wisdom, particularly with moving from a knowledge to a practice of the wisdom principles as it relates to transformative processes in ones way of life. To John Theosophy is a way of life, not simply an intellectual pursuit. Preceded at 6 pm by a Vegetarian Potluck Dinner - please bring a vegetarian plate to share in hosting John. To be able to live our life to its full potential in this day and age, it requires us to learn more skills and understand more about our own Mind. For some each day is another wonderful day of beautiful experiences, while for some the day could be difficult dealings to the extent that is tiring and draining due to contentious interactions with information overflow. Mindful living session that takes you through understanding experiences that allows you to live with your full potential no matter what people, events and situation bring to you. With Ravi Mistry, Art of Living Facilitator National Coordinator, hosted by TheosophyPN, Palmerston North Central. educating the community to become “dementia friendly” and how to reduce your risk of developing dementia! Donna is an ex nurse, who has worked for Alzheimers Manawatu for 5 years, prior to that 9 years Managing Alzheimers Hastings - in that time building the community facility and services over that period. In the time here in Manawatu, services have more than tripled and now provide services throughout the region.She is currently working on future proofing the local services to meet the growing demands and increasing costs of services. Webcast from the Theosophical Society International Convention by International President Tim Boyd entitled The Heart's Wisdom. Tim Boyd specializes in speaking to Youth. "Breathing For a Better Life" experiential workshop - facilitated by Claire Bhavani Winzar, 7.30 pm Saturday 3 February. Find out how the nervous system is effected by what Claire calls "the Rolls Royce of yoga breathing techniques"
How could this one technique support you and your loved ones? The world is facing an unprecedented crisis, and there is widespread, deep concern. This presentation offers an analysis of the serious nature of the present world emergency, what we can do to positively affect it, and the significance of this in both esoteric and practical terms. Nicola was a guest speaker in New York City earlier this year on behalf of the Unity Trust at The Edgar Cayce Centre. She also spoke at Anthroposophy N.Y.C. The work was endorsed there by Marianne Williamson. Know Universal Law and Your Self - Be your own Master, for the highest good of all concerned. Science has shown in reality, a person’s perception, not genetic programming, is what spurs all action in the body. It is actually our beliefs that select our genes, that select our behaviour. Our emotions physically shape reality! Anthea, a science (and maths) teacher, knows the difficulties a lack of knowledge of Universal Law caused her. Therefore she likes to bring forward science that verifies the Ageless Wisdom teachings. - on our illumination by the Soul and the True Reality. Public welcome $5 (non-waged $3) Members $2. The Growth of Consciousness of the heart and the soul is the inner reality that is blind to the lower mind. It is on the higher mind that the soul and the TRUE REALITY can ILLUMINATE the personality. The personality becomes SOUL INFUSED and the GREAT SPIRIT can be known on the ANCIENT PATH of INITIATION. introduction from Helen Sussmilch, with DVD showing the impact of meditation on people’s lives. presentation by Helen Sussmilch who spent six months on retreat in Spain with the Ishayas of the Bright Path during 2016. Helen in discussion will cover our desires, our true nature, how we forgot this, the impact of limiting beliefs, how to return to our natural state of being and how to experience this state permanently. She will explain the basis for this meditation practice, and its benefits for personal growth - physically, mentally and emotionally. Warwick traced the roots of the Ancient Wisdom Teachings – the basis of the Mystery Tradition – from Ancient Egypt forward, with connections to the East. It included references to the development of the Greek Elysian mysteries, the Rosicrucian philosophy and the masonic orders, including an outline of the original Egyptian Mystery Schools and their initiations. Warwick aims to provide a forum for discussion - there is much ‘fable’ and mystery on this subject which has a strong connection to the development of theosophical understandings. HPB had her initial training in Egypt with an Egyptian Master and appreciated the source of the Ancient Wisdom knowledge before coming under the influence of her later Masters. ‘Isis Unveiled’ makes it quite clear about her early links to the Egyptian Mysteries, and the source of the wisdom teachings. Warwick Keys is a researcher writer and a past NZ Theosophical Society President. Exploring the power behind thoughts and words and how they affect ourselves and those around us. Here we look at how our thoughts create our reality and how we create powerful thought forms which affect every aspect of our lives - not only in this incarnation but in future ones - and how we may dissolve them. John Vorstermans is the National President of the Theosophical Society in New Zealand. John is a qualified Ayurveda medical practitioner and herbalist, has a deep interest in the ancient wisdom tradition. He has studied, and endeavours to practice, the timeless wisdom principles. In recent times, John has focused on transformative processes that help people to understand themselves and create dynamic changes in their view of reality. John comes from an IT background with a special interest in Internet Communications and technology. The Topic is very timeless, profound, vital and unique in its nature. It expounds the goal of human life revealed by the Vedic Scriptures and enlivened by the Wise Masters. In the discussion we shall try to think more about our possible preparations as Spiritual Seekers for the divine journey to unveil our potential nature of Truth, which we call our Self. Let us try to reflect and rediscover our Real identity within us through grace of Lord. Sreejith Sreekumar(Sree) has spent a decade with Chinmaya Mission, Spiritual Organisation in Bharat (India) pursuing the spiritual knowledge from the divine lineage of Sages who had learned and served under H H Swami Chinmayananda. He has committed to his Guru and continues to serve Chinmaya Mission and those seeking the highest Truth. He has conducted lectures and seminars on Eastern Philosophy viz. Advaita Vedanta, workshops & games on Personality Development, Self-Management Strategies and National Awareness for Chinmaya Yuva Kendra (Youth wing) in India. He is conducting Bhagavad Gita study group, Sessions in Vedanta and Sanskrit in Palmerston North as well as online (Skype) Vedanta study sessions as part of the life of Service towards fulfilling his Master's Mission and Vision. Self Development Workshop - Self Discovery with the Path of Knowledge - Know Yourself with Laughter, Love and Light. About the Path of Knowledge - Theosophy or the Ageless Wisdom – The Theosophical Society was set up for the purposes of investigating Universal Laws. Its first aim is acknowledgement of the oneness of all life. The second the method of investigation in preparation for the third – the investigation of the powers hidden in nature and latent in man. Knowledge of the Law enables us to know who we really are and be liberated. Terrorism and strife might seem to dominate the news at times, but beneath it all is a mighty groundswell of goodwill and connection; caring for planet and people. It is nothing less than a spiritual movement towards global consciousness. Discover what vital seeds the Theosophical Society has been planting for this global movement to emerge. Murray Stentiford combines a lifelong interest in science, music and spirituality with a passion for exploring and sharing things. He sees Theosophy as a unifying framework that embraces the endless facets of human existence. Murray has held several positions of responsibility in the Theosophical Society over the years, including National Vice President and National Education Coordinator. He has a Masters degree in Physics and is an accomplished musician. Feeding the Planet – challenges for the future. As world population increases and demand for protein rises with growing middle classes in developing countries, can the world produce enough food? Given that agri-food supply uses around one third of end-use energy and produces around one quarter of all greenhouse gases, will we need to move away from animal proteins (mainly milk and meat products) to vegetable proteins? If so, what are the implications for NZ? Ralph Sims is Professor of Sustainable Energy at Massey University where he has researched renewable energy and climate change mitigation for several decades. He chaired the Royal Society of New Zealand panel for the 2016 study Transition to a Low-Carbon Economy for New Zealand and for Assessment Reports of the Intergovernmental Panel on Climate Change (IPCC) has led teams of authors on Energy Supply (2007), Renewable Energy Integration (2011), and Transport (2014). He was Senior Researcher at the International Energy Agency (IEA), Paris for four years and serves on the Scientific and Technical Advisory Panel for the Global Environment Facility (GEF), based in Washington D C and linked with UNEP and World Bank. He is presently contracted by UN FAO to lead several projects on reducing greenhouse gas emissions in agri-food supply chains and has consulted for many organisations including OECD, Shell, Chevron and Meridian Energy. Saturday 29 April 7.30 pm - Guy Donaldson with "The Tree of Life"
Even as traditional forms of religion struggle for membership in a science-informed society, the desire for meaning in life remains as part of our humanity. The ancient Qabalistic symbol of the Tree of Life, mentioned briefly in Genesis, is said to have been the soul of Judaism. However while it became known amongst intellectuals in medieval and Renaissance times it is little known today. Nevertheless it remains a wonderful mechanism for illuminating the essences and commonalities of such great wisdom traditions as Judaism, Hinduism, Buddhism, and Christianity. It moreover embodies the Big Bang Theory of the beginning of everything, and offers a map of consciousness that connects to insights that have become available through quantum physics. Guy was a senior lecturer in music education at the Massey University College of Education until 2004, when he took leave to pursue his passion for performance and music teaching. He is well known in the Manawatu area as a teacher, adjudicator, piano soloist, accompanist, chamber music player, music coach and conductor. 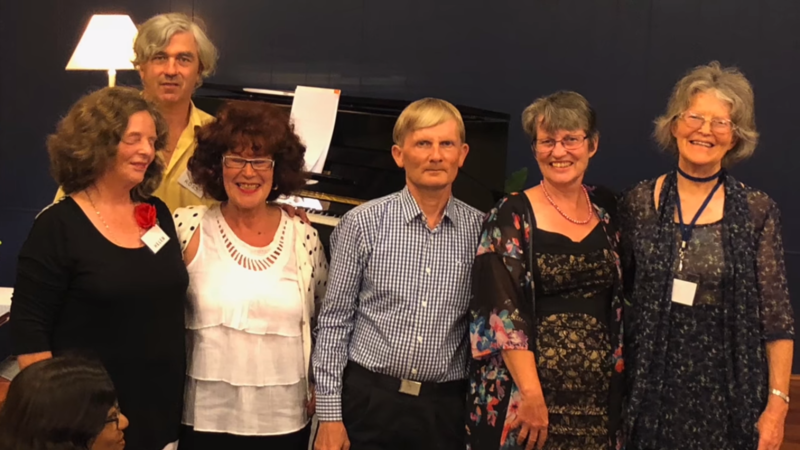 He is the convenor of the Globe Sunday Matinee concert series, formerly the Te Manawa Art Gallery Sunday concert series and has been the musical director of the Renaissance Singers since 1989. Guy’s performing schedule in 2016 has included chamber music performances as part of the Globe series and accompanying the Palmerston North Choral Society in a programme of opera music. He has also given a solo piano recital featuring music by local composers Helen Caskie and Graham Parsons. On June 24 2017 he will conduct the Renaissance Singers in a programme entitled Into the Light. Although Guy is best known as a musician, he has a passion also for researching big picture issues. He has given a number of talks for the Theosophical Society. In 2015 He gave a talk to U3A on changes and conflicts in music in the twentieth century, and in 2016 he spoke on the impacts of 1990s political decisions on New Zealand life. Tuesday 4 April 7.30 pm - Dr Douglas Osto Ph D.
Donations Welcome to thePNTS TOS (The Theosophical Order of Service) to support the Palmerston North Safecity programme. When: Check out the Programme Details to find out upcoming presentations and events. Both members and public welcome. Library: Open 10.00am - 12.00 noon -- Usually every Saturday Email pn@theosophy.org.nz or phone Anthea 353 6221 if you wish to check. A few of the participants at Barry Bowden'sWorkshop "The Search for the Inner Self". From the left Committee members, Peter French, and Lorette Campbell, Vice President and Treasurer Helen Sussmilch, President Anthea Clement, and Julie Jeffrey, in front with TS Australia National Lecturer, Barry Bowden TS Australia and Margaret Torr.